Since the fall of State Socialism, eight of the world’s 12 largest automakers have established light vehicle assembly plants in Central Europe’s (CE) Visegrad Four Nations (V4) nations: the Czech Republic (Czechia), Hungary, Poland, and Slovakia. This process began in earnest in the early 1990s, with the major foreign direct investments (FDI) of Fiat in Poland, Suzuki in Hungary, and Volkswagen in Czechia. The success of these initial factories then attracted numerous foreign auto suppliers to these areas, and later, more assembly plants. Although it missed much of the 1990s boom, the central location of Slovakia’s city-regions, along with their skilled, but relatively inexpensive labor force, have resulted in that nation becoming a prime production base for the export of automobiles to developed Europe during the 2010s, as well as to North America. Through brief review of automotive production related development in the Bratislava, Trencin, Trnava, and Zilina City-Regions (heretofore, the city-regions in the Bratislava-Zilina Corridor), and drawing upon World Systems Theory and research on the CE auto industry, this article examines whether or not Automotive Industry related foreign direct investment (i.e., Auto FDI) also has served to advance Slovakia’s structural position in the globe’s industrial division of labor from periphery to semi-periphery. Following a comparison of its automotive industrial economy with that of Wallerstein’s [1, 2] and Chase-Dunn & Hall’s  five types of semi-periphery nations, it finds that Slovakia’s position in the global automotive industry’s division of labor qualifies as a semi-periphery nation under only one of their typology’s categorizations - its fortuitous geographic location in the CE. This analysis also suggests that although auto FDI has transformed the city-regions in the Bratislava-Zilina Corridor into important loci for car production, it also has made the economies of its city-regions,, overly dependent upon core-based, foreign transnational corporations (TNCs) in the highly cyclical motor vehicle industry. Based upon this, the article concludes that despite Slovakia’s Gross Domestic Product (GDP), Gross National Income (GNI), and GDP and GNI per capita qualifying it as a semi-peripheral nation, the structural position its major city-regions now play within in the world automotive division of labor has not yet risen to this status . Rather, the role its major city-regions play, at least within the world motor vehicle production chain, now more closely resembles what may be labeled the upper perimeter of the periphery. In other words, they have achieved a position situated at the upper boundary of the periphery, approaching semi-periphery, but where peripheral-like economic relations have remained much more prominent than in most scholarly descriptions of semi-periphery nations, particularly the original Asian NIEs and today’s BRICs (Brazil, Russia, India, and China . In the next section, the article will review some of the major theoretical perspectives examining core-semi-periphery-periphery relations. This will include a separate section focusing on recent literature analyzing auto industry production in the CE. It then will chronicle the post-1990s rise of motor vehicle manufacturing in Slovakia’s four largest city-regions, followed by the aforementioned section analyzing the area’s structural position in the world motor vehicle production chain. Numerous theories have examined dominance-dependency relationships between transnational corporations (TNC) headquartered in the wealthiest, most developed ‘core’ countries and regions/workers situated in less affluent, developing, ‘periphery’ nations. One of the earlier important works on the topic was Roderick McKenzie’s  seminal article, ‘The Concept of Dominance and World Organization.’ Later, Hans Singer and Raul Prebisch, Paul Baran, Andre Gunder Frank, Stephen Hymer, Samir Amin, Richard Barnet and Ronald Muller, Fernando Cardoso, R. B. Cohen, Peter Evans, and others provided critical and astute commentaries on the situation. However, perhaps the most influential post-war theoretical paradigm analyzing core-periphery relations was ‘World Systems Theory.’ Although frequently critiqued and not quite as popular as in the 1980s and 1990s, Immanuel Wallerstein’s conceptual framework remains illuminating when examining the world motor vehicle production chain. As detailed countless times before, Wallerstein [1, 2, 7, 8] chronicled how, since the rise of modern capitalism in the 16th Century, the world’s territorial units have evolved into a stratified, three-tiered, political-economic system. At the top of this hierarchy stood the most industrialized core countries, which established and maintained their hegemonic power by expanding their production markets into, and extracting surplus value from, the less developed/industrializing semi-periphery and the underdeveloped periphery economies. In other words, for Wallerstein, core, semi-periphery, and periphery represented the three distinct structural positions within the world capitalist system’s international division of labor. This was not to suggest, however, that Wallerstein believed that all countries within a given structural position were the same economically and/or politically (for example, North Korea and Bolivia were both periphery nations). Nor did he feel that the current status level of any given nation was static, but rather could, in fact, fluctuate over time. For example, he claimed that if a semi-periphery nation strengthened its political, economic and industrial infrastructure, and achieved the right balance of wage levels, labor organization, purchasing power, technology, and competitiveness, it was possible for it to figuratively, ascend to the core. Nevertheless, while Wallerstein contended that it was possible for nations to advance within the world capitalist hierarchy, he also claimed that the core constantly attempted to maintain its exclusive superiority by utilizing redistributive policies (such as plant relocation, overseas aid, and raw materials extracting) to purposefully divide non-core nations into competing subgroups. As a result, the economies of the semi-periphery were frequently furthered by the core, and thereafter, the former was utilized as middlemen to reinforce core hegemony, to prevent alliances between semi-periphery and periphery nations, and to further exploit the periphery. Since the initial publication of Wallerstein’s typology during the early 1970s, World Systems Theory has been augmented by the works of such prominent scholars as Christopher Chase-Dunn [9-11], Giovanni Arrighi [5, 12, 13], and Michael Timberlake , among others. Later in this article, Chase-Dunn and Arrighi’s discussions on semi-periphery nations will provide important insight into the context for auto production development in the Bratislava-Zilina Corridor. Most relevant to this analysis are Chase-Dunn & Thomas Hall’s  criteria for classifying an economy as a semi-periphery nation, and Arrighi’s article with Jessica Drangel which expanded Wallerstein’s triad to five-tiers, including the interim positions of ‘perimeter of the core’ and ‘perimeter of the periphery’ . Over the past decade, research on the dramatic expansion of motor vehicle production in the post-Socialist Central European (CE) and its resulting TNC-State/region machinations has made an important topic to the literature on core-semi-periphery-periphery relations. The highlight of this was the special issue in European Urban and Regional Studies edited by Boleslaw Domanski & Yannick Lung . These two authors, along with Petr Pavlinek and Adrian Smith, have been at the forefront of such analyses of the CE. While Domanski has focused upon auto FDI in Poland, Lung [16, 17] has studied various areas in what he calls the European periphery, including detailing the spatial restructuring of production among core and periphery Mediterranean nations. Meanwhile, Pavlinek who has written extensively on auto FDI in Czechia, also has covered the issue in Slovakia, Poland, and Hungary. Smith, on the other hand, has offered a broader examination of the post-Socialist industrial transformation in Slovakia. According to Domanski & Lung , the shift in motor vehicle production from Western Europe to the CE was fueled by a combination of foreign direct acquisitions of local firms, joint-ventures, and increasingly, new plant construction. They explained that initially, large foreign automakers were attracted to the European periphery by the possibility of rapid sales in emerging post-Socialist Europe and by the potential low-cost sourcing options for exporting components to Western Europe [16, 18]. However, this ’Go East’ strategy, they argued, was “driven by more than [just] wage-cost advantages and market access. Quality, reliability, and proximity provided further important conditions conducive to investment and production growth” . Furthermore, they claimed that the centrally located, ‘integrated periphery markets’ of the V4 nations of Czechia, Slovakia, Hungary, and Poland, best represented these characteristics [18, 19]. They stated that later, the former Yugoslav republics of Slovenia and Serbia, along with Romania and Turkey, would provide competitive alternatives to the V4 . In his own work, Domanski has detailed how core auto FDI has fueled the creation of a sizable multinational supplier base in Poland, with nine out of the world’s ten largest automotive components manufacturers located in the country, including Delphi, Lear, and TRW of the USA, and Valeo and Faurecia of France. In addition, Fiat (Italy), General Motors (USA), Toyota (Japan), and Volkswagen (Germany) had engine plants there . As a result, Domanski claimed that auto FDI has helped push Poland, as well as Czechia and Slovakia, to semi-periphery status in the world economy [21-23]. Based upon their case studies of Germany and Poland, and interviews in Czechia and Ukraine, Jurgens and Krzywdzinski [24, 25] supported Domanski’s assertions. They concluded that “the overall effect of the expansion of the automotive industry on growth and employment in the CE was positive” . In contrast to these positive assertions, Petr Pavlinek, Eric Rugraff, and Adrian Smith and Adam Swain have claimed that since CE nations have become so over-dependent upon foreign capital, especially motor vehicle related FDI, that they have not, as of yet, ascended to a semi-periphery position, at least in the European automotive production chain [19, 26-36]. This has been especially the case for Slovakia . Despite the increasing role of the CE in…passenger car assembly, [its] position …in the European automotive … division of labor continues to be disproportionately weak…Strategic functions, including R&D, have remained highly concentrated in the West European core, especially in Germany, without any signs of diminishing … [and] the degree of concentration in the core [was] increasing during the 2000s . This situation underscores the peripheral nature of the CE… in the European automotive production system after 1990. While the standardized vehicle assembly and the production of components have dispersed to the CE periphery mainly to exploit lower production costs and more flexible labor practices, the whole system [remains] controlled from the core through the direct ownership of all CE-based assemblers and most component suppliers by core-based TNCs . So which perspective best represents the current situation in the Bratislava-Zilina Corridor? Has auto FDI helped propel Slovakia to a semi-periphery position in the world motor vehicle production chain? Or have developments merely been emblematic of traditional core-periphery relations? After providing a brief history of light vehicle manufacturing in the Bratislava-Zilina Corridor, this article addresses these questions. Drawing upon World Systems Theory, Pavlinek, Evans, and others, it then suggests that while auto FDI has helped to increase post-socialist Slovakia’s socio-economic indicators to levels similar to that of middle income nations, the nation’s structural position in the world’s automotive industry’s division of labor has not yet reached to semi-periphery status. Rather, in terms of the auto industry, Slovakia has achieved a status which befits what might be called the upper perimeter of the periphery, where core-peripheral-like economic relations have remained much more prominent than in many other semi-periphery nations, particularly, the original Asian NIEs and BRICs. Following World War II, the Soviet bureaucracy pegged Czechoslovakia and East Germany as the primary bases for light vehicle production in the CE. Hungary was selected as the site for bus manufacturing [27, 40, 41]. In Czechoslovakia, the motor vehicle industry was nationalized, and Skoda, founded in 1895 in the town of Mlada Boleslav, north of Prague, was authorized as the sole-producer of small, inexpensive passenger cars in the region. Meanwhile, Tatra, which began making vehicles in 1850 in the present-day eastern Czech town of Koprivnice, was assigned the task of building large luxury cars [27, 40]. “This directive meant, for example,” that Jawa Motors of Prague was ordered to cease its small car production and to concentrate only on motorcycles . In addition, Skoda truck production was allocated to three Prague-based firms, Aero, Avia, and Praga. In the 1950s, as the Czechoslovakian Government was instructed to focus more heavily upon the defense industry, the nation’s light vehicles production was reorganized. During this period, Tatra’s passenger car production was shifted to Skoda’s Mlada Boleslav plant and the former was directed to build military trucks and heavy-duty defense vehicles. Additionally, Jawa’s motorcycle and moped production was transplanted from Prague to the Povazska Bystrica District of present-day Slovakia’s Trencin Region; this district would later become home to foreign firms manufacturing tires, glass, cable assemblies, plastics, and metal components for automobiles . During the 1960s and 1970s, the State invested more heavily in vehicle production, modernizing and expanding Skoda’s operations through the construction of several new factories. In response to pressure from Slovak politicians, this included a decision in 1971 to build a Skoda branch plant in Bratislava, which would become known as BAZ. Officially launched in the Bratislava Borough of Devínska Nova Ves on April 3, 1974, BAZ began by assembling Skoda 731 model sedans, 732 station wagons, and BAZ-brand light trucks, from parts manufactured in Czech plants . Also during the 1970s, output of light commercial vehicles was shifted from Vrchlabi (Czechia) to Slovakia’s Trnava Region, and tractor engine production commenced in the Zilina Region’s defense-industry city of Martin [27, 43]. Thereafter, large agricultural tractor manufacturing was shifted from Brno in Czechia to Martin. At the time, Martin was dominated by the large armaments firm ZTS TEES, whose “production profile [included] “Soviet-licensed T-model tanks, locomotives, locomotive engines, railway wagons, diesel motors…. and iron and steel” . 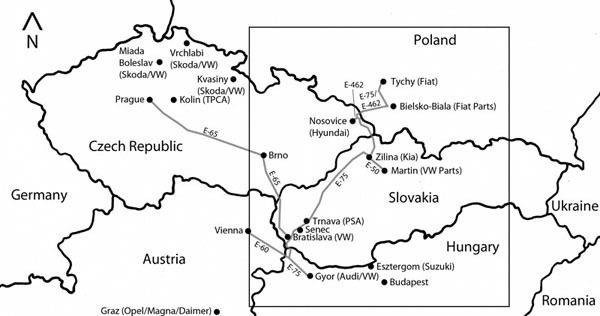 Although these State-owned endeavors would never manufacture more than a few thousand Skoda cars annually under Socialism, the city-regions in the Bratislava-Zilina Corridor (Bratislava, Trnava, Trencin, and Zilina) would later become the core nodes of FDI in the Slovak auto industry; Nitra (automotive parts) and Kosice (steel) also would become complimentary nodes (again see Fig. 1). The bratislava, trnava, and zilina city-regions in slovakia. Whereas the 1970s was a period of growth, the 1980s was marked by insufficient and misguided State investment. As a result, the technology, reliability, and fit and finish quality of Skoda’s small, inexpensive models lagged far behind Western automobiles. In 1989, this left the company highly vulnerable to foreign takeover, when the Iron Curtain fell and the Czechoslovakian economy was opened to market capitalism. Thereafter, in an effort to save its debt-ridden domestic car industry, the central government sought out foreign capital to partner with Skoda. On December 9, 1990, it found its savior, selecting VW over 23 other suitors, and selling the German automaker a 31 percent stake in Skoda’s Czechia-based operations for €315 million ($416 million) . Three months later, on March 12, 1991, VW again outbid five others for an 80 percent ownership share in BAZ, Skoda’s branch plant factory in Bratislava [27, 37, 44]. As presented in Table 1, VW-BAZ assembled its first two VW Passat sedans at its completely re-tooled Bratislava plant in December 1991. Serial production commenced two months later in February 1992. Over the next two years, a paint shop and a gearbox assembly line was added, along with the manufacturing of VW’s popular Golf model and in 1994, VW bought out BAZ and took total control of the Bratislava operations; it secured 100 percent ownership in Czechia’s Skoda in May 2000 . During the late 1990s and early 2000s, aided by €33 million ($44 million) in tax abatements from the government’s 1999 ‘Development of the Automotive Industry’ Initiative, VW continued to widen its Slovak footprint. This program also attracted numerous large foreign suppliers, such as Johnson Controls, Magna, Faurecia, Lear, SAS Automotive, and Brose, many of which located just north of VW Bratislava in the city’s Lozorno Industrial Park . Following the subsidies, VW expanded and retooled the Bratislava factory, resulting in a doubling in output to more than 200,000 vehicles by 2002. This included the launch of VW Polo subcompacts in January 2000 and the VW Touareg SUV in June 2002, with the latter date also commencing manufacture of Porsche Cayenne SUV bodies. These additions were followed by the introduction of the Audi Q7 luxury SUV in November 2005. VW also opened a large factory in May 2000 for the purpose of manufacturing gearboxes, chassis components, and other parts for its VW, Audi, Skoda, SEAT and Porsche brands, with 93 percent of the output being exported out of Slovakia . In 2007, Polo production in Bratislava was halted and in March 2008 replaced by the larger Skoda Octavia model. The factory ceased output of the Octavia in 2010 as part of VW’s major retooling and expanding of the complex. Upon completion in late-2011, this approximately €302 million investment ($400 million) boosted plant capacity to 400,000 vehicles per year. In 2015, the factory employed 9,000 workers and produced 344,892 vehicles in 2013; output rose to 394,474 in 2014 [45-47], (Table 1). Twenty years after its opening, VW‘s Bratislava plant has remained Slovakia’s largest single FDI project. Including its Martin parts factory, the automaker employed 9,900 people nationwide . In addition, in large part because of the Bratislava assembly plant, more than two-thirds of all FDI coming into Slovakia since 2002 has been allocated to the Bratislava Region; this proportion ranged between 55.9% and 62.5% from 1995 to 2001 [42, 50]. As will be discussed later, regions in northern Hungary and Eastern Czechia also have greatly benefitted from VW’s presence in the Bratislava-Zilina Corridor. Light vehicles production plants in slovakia and in adjacent regions of czechia and hungary, 2013. In total, VW has produced more than three million vehicles in Bratislava and more than four million gearboxes (transmissions) in Slovakia over the past 20 years [45, 48, 49, 51, 52]. However, in 2013, the German automaker was no longer the sole foreign car manufacturer with an assembly plant in Slovakia. After receiving a government incentive package of €170 million ($225 million) in January 2003 Peugeot-Citroen (PSA) of France agreed to build an assembly complex in Slovakia’s Trnava city, located approximately 44 miles (71 km) north of VW Bratislava (See Fig. 2). As shown again in Table 1, PSA’s factory, which launched production in October 2006, had an annual capacity of 300,000 vehicles. The plant employed 3,200 people in 2013, when it produced 248,411 mini hatchbacks and multi-purpose vehicles (MPV) [53-55]. Slovakia’s city-regions in the bratislava-zilina auto corridor and nearby auto clusters. In March 2004, a year after PSA’s announcement, the South Korean automaker Kia, a division of Hyundai Motors, accepted approximately €982 million ($1.3 billion) in financial incentives, infrastructure, and housing subsidies, in order to construct a plant in the Village of Teplicka nad Vahom, in Slovakia’s Zilina Region, situated 100 miles northwest (160 km) of Trnava , (Fig. 2). The facility, which built its first car in December 2006, had an annual capacity of 300,000 vehicles. Kia employed 3,800 workers at the factory in 2013, which manufactured 313,000 subcompact hatchbacks, MPV, and SUV in 2013 , (Table 1). In addition to the substantial incentive packages, both PSA and Kia both were attracted to the Bratislava-Zilina Corridor by its location, its transportation infrastructure, the presence of several large Tier-I multinational automotive components suppliers, and the area’s relatively educated, skilled (particularly in technical, mechanical and metalworking), inexpensive and non-adversarial labor force; for example, Kia’s facility was situated just 20 miles (32 km) west of VW Martin [63, 64]. These location decisions then prompted several of their own home nation Tier-I suppliers to also open plants in Slovakia. As a result of VW, PSA, and Kia’s facilities, employment in motor vehicles and parts related manufacturing in Slovakia had expanded from less than 1,000 in 1990 to 22,000 in 1993 and then 81,682 in 2012 [49, 57]. This total included 316 auto suppliers, the large majority of these being transplants from Germany, France, America, and more recently, South Korea. Among these, 242 were located within the Bratislava-Zilina Corridor extended, which included neighboring the Nitra and Banska Bystrica Regions [42, 49, 57], (Fig. 1). Moreover, in 2013, the nation produced 906,303 cars and light passenger trucks (i.e., vans, SUV/CUV, and MPV, see Tables 1, 2). According to OICA , this constituted an increase of 631,166 or 213.67% from 2000; Ward’s World Motor Vehicle Yearbook  placed this expansion at 745,224 or 410.97%. In both cases, Slovakia’s 2013 output represented a 160-fold enlargement from the 5,732 vehicles assembled in the country in 1993, including just 2,958 cars [48, 52]. Top 15 vehicle producing nations per 1,000 in population, 2013. Overall, Slovakia was Europe’s seventh largest auto producing nation in 2013 . More impressively, as shown in Table 2, at 167.36 vehicles per 1,000 in population in that year, Slovakia ranked first worldwide in vehicles produced per capita; it was followed by Czechia and South Korea. No other CE nation besides Czechia and Slovenia produced more than 23 automobiles per 1,000 people. As shown in Table 3, per capita production was 368.60 in the Bratislava-Zilina Corridor, and area which contained 45.40% (or 2.46 million people) of its nation’s population in 2013, but which produced 100.00% of its light vehicles. Vehicle production/1,000 in population for slovakia’s city regions, 2013. In addition, VW’s presence in Bratislava has served as a catalyst for economic growth not only in Slovakia, but also in nearby city-regions in Hungary and Czechia . This materialized in December 1993, when VW began building engines in a plant just 49 miles (78 km) south of the VW Bratislava in Gyor, a city situated in northwest Hungary’s Gyor-Moson-Sopron County (Again, see Fig. 2). As displayed in Table 1, the facility now known as Audi Hungaria, began manufacturing cars (sporty Audi TT) in April 1998. This was followed in November 2007 by the assembling of approximately 200 Audi A3 convertibles (cabriolet) in November 2007 [58, 59]. In 2013, VW completed another major expansion in Gyor, investing €900 million ($1.2 billion) and transforming its Hungarian operations into a full-fledged assembly plant. In the process, the automaker raised its total employment at the site from 6,138 in 2009 to more than 9,000 on June 12, 2013, upon the commencement of production of Audi’s brand-new A3 sedan model. Meanwhile, annual vehicle production capacity in Gyor jumped from 55,000 in 2009 to 125,000, with the plant building 42,851 cars in 2013. This total jumped to 135,272 in 2014, when the factory also manufactured 1.97 million engines and employed 11,000 workers . In total, VW has invested more than €5.7 billion ($7.5 billion) in the complex and has long-term plans that will ultimately raise plant vehicle output to 340,000 by 2018 [59, 60]. Finally, as a result of its success in Zilina, in September 2005, Hyundai Motor announced that it would produce its own brand-named subcompact cars at a newly constructed, second CE assembly plant, situated just 53 miles (85 km) west of Zilina in the Village of Nosovice, within the Frydek-Mistek District of northeastern Czechia’s Ostrava Metropolitan Area (Again, see Fig. 2). The first vehicles at the so-named Hyundai Nosovice Plant began rolled off the assembly line on November 3, 2008. The factory, which built 303,460 subcompacts and MPV in 2013, employed 3,300 workers and had a typical annual capacity of 300,000 vehicles , (Table 1). The net result of these investments has been the development of what may be called the Bratislava-Gyor-Zilina-Ostrava Auto Production Zone, an area traversing parts of three nations (western and central Slovakia, eastern Czechia, and northwestern Hungary), with a nucleus of Bratislava, and a spine running along designated European Highway 75 or E-75 (See Fig. 3). Within this automotive production region’s three interconnected auto clusters - VW Bratislava-Audi Gyor; PSA Trnava; and Kia Zilina-Hyundai Nosovice- there were five foreign light vehicles assembly plants, employing 30,300 workers and with production capacity of 1,425,000 vehicles annually. These facilities also helped to spur the creation of approximately 100,000 automotive supplier jobs in the extended area . The Bratislava-Zilina auto corridor and other assembly plants in the CE context. The development of the Slovaka’s Bratislava-Zilina Corridor into a manufacturing hub for some of the world’s largest foreign automakers has been a prime example of how FDI has driven economic growth within certain post-Socialist nations. The related acceptance of Slovakia into the EU and the European Monetary Union (the Euro) suggest that its national economy has benefitted greatly from the presence of foreign automakers. On the other hand, has FDI transformed Slovakia into a semi-periphery nation situated between the core and periphery within the globe’s industrial division of labor? Or, have these developments merely made the long-term economic well-being of its largest city-regions and its nation, too overly dependent on the highly cyclical and mobile auto industry? The next sections will explore this question. Slovak Economy, Semi-Periphery or Upper Perimeter of the Periphery? Wallerstein’s initial early 1970s categorizations of semi-periphery nations included “a wide range of [diverse] countries in terms of economic strength and political background,” such as Brazil, Finland, South Africa, South Korea, and much of Eastern Europe. He claimed that these former periphery nations had taken various paths towards their advancement within the world economic hierarchy. In addition, he suggested that the most successful of these nations were those that had risen to semi-periphery status through import-substitution; that is, they manufactured products that they had formerly imported from core countries. On the other hand, others had enlarged their economies by producing goods no longer desired in core countries. Still, others advanced when profit-seeking producers within core nations shifted their manufacturing location to their lower wage nations. When core producers face a situation of over-supply, they begin to compete intensely with each other to maintain their share in a comparatively shrinking world market for their finished goods (especially machinery). At this time, semiperipheral nation can, up to a point, pick and choose among core producers not only in terms of sale of their commodities (viz. OPEC oil) but also in terms of welcoming their investment in manufactures… . On the surface, the latter quote seems to describe the current over-supply of production in core nations and Slovak government’s selection of VW over five other suitors to acquire BAZ Yet, did the Slovak Government really pick VW or did VW actually select Bratislava for its lower wage, but relatively skilled labor force as a site to produce cars for export to the core? After all, the German automaker tendered the highest bid for the near-bankrupt BAZ only after acquiring its former parent, Skoda, whose main plant was located in Mlada Boleslav in north-central Czechia, just 205 miles (331 km) northwest of BAZ Bratislava. In reality, the integration of BAZ facility enabled VW’s to create process and production scale synergies with its core, export-oriented Czech operations [37, 41, 50, 57, 62, 63]. As to whether or not the nascent, post-Socialist Slovakia of 1993 was a semi-periphery nation capable of picking and choosing which industries and FDI it accepted - the answer is, probably ‘not.’ Moreover, what seems more relevant is whether or not VW’s presence in Bratislava, along with that of PSA in Trnava and Kia near Zilina, actually has advanced the Slovakia’s economy position in the globe’s industrial division of labor from periphery to semi-periphery in 2015. With respect to the latter, and drawing upon definitions of semi-periphery, this is highly debatable. Slovak Economy, Core and Peripheral Forms of Organization? According to Chase-Dunn & Hall , Wallerstein’s conceptualizations of the semi-periphery included five types of nations, those: “1) … [That] mixed both core and peripheral forms of organization; 2) … [that were] spatially located between core and peripheral nations; 3)… [that were] spatially located between two or more competing core regions; 4) … in which mediating activities linking core and peripheral areas take place; and 5) … which had institutional features [that were] intermediate in form between those forms in adjacent core and peripheral areas.” . A review of these five variations suggests that Slovakia only classifies as a semi-periphery nation based upon the most superficial criteria of the five. In reference to Wallerstein/Chase-Dunn & Hall’s first type of semi-periphery nation, does Slovakia have both core and peripheral forms of organization? Superficially, the answer to this is yes. However, essentially all of Slovakia’s core-like industrial organizations were owned/ controlled by foreign TNCs, particularly major automakers and suppliers based in Western Europe, North America, and developed East Asia. According to the Slovak Investment and Trade Agency or SARIO, approximately 17 percent of all employment in Slovakia in 2012 (or 81,682) was directly employed in the motor vehicle industry, with more than three-quarters of this working for foreign firms. Thousands more Slovaks had indirect jobs servicing these auto plants and their workers. Moreover, nearly one-third of the value of all industrial production nation-wide and 30 percent of the value of all exports were derived from the auto sector in that year [49, 57]. Next, despite its plethora of foreign TNCs in manufacturing, Slovakia’s average monthly wage of €805 ($1,064) in 2012, ranked it third among four V4 nations of CE, trailing Czechia’s €998 ($1,316); Poland’s €842 ($1,113), but ahead of Hungary’s €771 ($1,019) . In addition, Slovakia’s national average wage has continued to be very unevenly distributed, inflated by its capital city region of Bratislava. As shown in Table 4 for the more recently available 2013, the national average monthly wage of €891 ($1,177) was significantly lower than that of the Bratislava City-region, whose residents secured an average monthly wage of €1,182 ($1,627) in 2013. In fact, this disparity has remained fairly constant since 2001. Average monthly wages in slovakia by region, 2001-2013 (in € rounded). As also presented in Table 4, whereas the capital area’s monthly wages expanded by €599 ($825) or 102.74% between 2001 and 2013, the national average increased by just €448 ($617) and 101.07%. In other words, whereas annual wages in Bratislava increased by €7,188 ($9,900) from €6,996 ($9,900) to €14,184 ($19,524) between 2001 and 2013, the national annual wage grew by only €5,376 ($9,900) from €5,316 ($7,317) to €10,692 ($14,717) during this period. Meanwhile, despite hosting major foreign automotive assembly plants and/or Tier-I suppliers, the city-regions of Trnava (€10,092 or $13,891), Zilina (€9,840 or $13,545), and Trencin (€9,708 or $13,363) all continued to have annual and wages below the national average. The situation was even more uneven between Bratislava and other regions of Slovakia [66, 67]. Lastly and as previously mentioned, in large part because of the Bratislava assembly plant, more than two-thirds of all FDI coming into Slovakia since 2002 has been spent in the Bratislava Region. Moreover, this proportion has risen over time, growing from between 55.9% and 62.5% during the 1995 to 2001 period. In summary words, as Pavlinek [19, 32, 41, 68] and his collaborators claimed, although Slovakia may have become a middle income nation with semi-periphery-like GDP and wages, its widening uneven development and over-dependence on export-oriented, TNC-based Auto FDI, which has made it extremely vulnerable to global economic cycles, suggested that its organizational forms were more periphery-like than semi-peripheral. In sum, Slovakia really does not qualify as a semi-periphery nation under category one of Wallerstein/Chase-Dunn & Hall’s typology. In reference to Wallerstein/Chase-Dunn & Hall’s second, third, and fourth categories/types of semi-periphery nations, Slovakia, located between Austria (and indirectly Germany) and emerging Eastern Europe, similar to its CE neighbor, was spatially situated between Europe’s core and periphery nations. Moreover, this was one of the primary factors attracting major automakers to the Bratislava-Zilina Corridor. On the other hand, without any core nations to its east, the vast majority of Slovak automotive exports were exported Western nations. Bratislava was currently the only plant worldwide manufacturing VW Touareg and one of only two that were building Audi Q7 (the other was in India). Therefore, it could be argued that since these two VW luxury SUV models were bound for the U.S. and Canada, Slovakia has mediated activities between Germany and two other core nations, the U.S. and Canada. Nevertheless, only a combined 28,079 Audi Q7 and VW Touareg were sold in the U.S. and Canada in 2013. In comparison a total of 134,404 of these vehicles were built in Bratislava in the same year [51, 52, 69]. Moreover, all of the Hyundai-Kia light vehicles that were sold in the two countries in 2013 were produced in either the U.S or South Korea, and the last vehicles delivered by PSA in the two North American nations was in 1992 . Consequently, Slovakia does not seem to fit within Wallerstein/Chase-Dunn & Hall’s third type of semi-periphery nation. Similarly, since nearly all of its automotive parts were domestically manufactured, or built in Germany, France, or South Korea, Slovakia was not a region in which its mediating activities truly linked core and peripheral areas. Its plants primarily served as a periphery-like export base for TNCs seeking to cut production costs by assembling their finished goods in a lower wage area and then by shipping outputs back to core countries in Western Europe. In other words, Slovakia’s manufacturing activities did not seem to suggest that it qualifies as a semi-periphery nation within Wallerstein/Chase-Dunn & Hall’s fourth category. Finally, Slovakia’s institutional features, at least in industrial organizations, do not seem fit within Wallerstein/Chase-Dunn & Hall’s fifth type of semi-periphery nations, as they appear more peripheral-like than intermediate-like. For example, unlike Evans’  descriptions of East Asia’s Newly Industrializing Economies (NIEs) in the 1980s (particularly South Korea), or today’s largest semi-periphery nations, China, India, and Russa, Slovakia has no native-owned or operated motor vehicle producers. With the exception of a handful of Tier-II suppliers, the same held true for its automotive supply base, and for that matter, for most of its other industrial sectors. Next, Slovakia has essentially failed to launch a credible import-substitution campaign in the automotive sector. Well over half of the parts installed in vehicles finished in Slovakia still were imported from core nations. Additionally, total new cars sales in the country have represented only a tiny percentage of production, and the vast majority of vehicles sold, either new or used, have been imports. More specifically, automakers produced 906,393 complete passenger vehicles in Slovakia’s Bratislava-Zilina Corridor in 2013. One hundred percent of these vehicles were built by foreign automakers. In addition, of the 4.34 million vehicles manufactured in the nation between 2007 and 2013, nearly all (99 percent), were exported out of the country. Meanwhile, only 589,355 new cars were sold in Slovakia during this six-year period, or equivalent to 13.59% of total production [48, 49, 52]. However, the latter figure was misleading, as it represented all new car sales, irrespective of manufacturer. For example, when comparing sales and production figures for 2013 of only the brands sold in Slovakia by the three automakers manufacturing cars in that nation- VW (VW, Audi, Porsche, SEAT, and Skoda), Hyundai-Kia, and Peugeot-Citroen- the contrast becomes even more startling. As compared with the 906,303 light vehicles built by the three vehicle companies in Slovakia in 2013, only 41,947 new cars and light trucks were sold under these brands in the nation in that year, or a mere 4.63% of production; the latter figure also included light commercial vehicles. This percentage of sales to output has actually backtracked over time, despite the fact that vehicle production expanded by 378,140 or 71.60% between 2007 and 2013. In the interim, sales of these brands declined by 17,753 nation-wide or by 29.74%, from 59,700 in 2007 to 41,659 in 2013. In Audi’s case, it sold only 1,427 vehicles in Slovakia in 2013, irrespective of model, or the equivalent of only 2.25% of 63,543 vehicles VW produced under that marque in Slovakia in that year. In other words, only a very small segment of the approximately 82,000 workers employed in the automotive sector in Slovakia, or citizens of the country itself for that matter, had the financial wherewithal to buy the VW vehicles built in Bratislava. The same was the case for Audi Hungaria in Gyor, where Audi A3 convertibles (cabriolet), RS3, and TT Coupe and Roadsters were assembled. VW’s Tier-I and Tier-II suppliers in Slovakia followed a similar strategy. As mentioned earlier, 93 percent of the gearboxes, chassis components, and other parts manufactured at VW Martin were exported out of the country. More than two-thirds of Martin’s production was bound for VW’s massive Kassel, Germany transmission and components complex [45, 47, 49]. Most of the other parts fabricated, such as INA (bearings) and Continental Tires, both of Germany, exported more than half of their output. Similarly, only 5.53% of the 1.93 million engines built at VW’s Audi plant in Gyor in 2013`were installed in Hungarian or Slovak-made Audi vehicles. Conversely, the Gyor factory supplied approximately 1.6 million motors to Audi and VW vehicles built in Germany and Belgium, such as its popular A6, built in Neckarsulm, and A4, manufactured in Neckarsulm for the American market and at Audi’s main plant in Ingolstadt for Europe [57, 58]. Moreover, well over half of the parts installed in Bratislava vehicles were assembled outside of Slovakia . Related to this, among the 40 largest automotive suppliers in Slovakia, 29 were located within the four-city-regions in the Bratislava-Zilina Corridor. All 29 were foreign-owned, including 13 with 1,000 or more employees in 2013. With only a handful of domestic-owned firms even participating in the auto industry production chain, very little technology transfer has occurred between TNCs and native firms. In addition, Research & Development expenditures in the area have been minimal, with almost all of these operations remained in the core-nations of foreign automakers, particularly, Germany, France, South Korea, and the USA [28, 71, 72]. Finally, further evidence supporting the contention made in this article that Slovakia has not yet achieved semi-periphery status comes from the United Nations Conference on Trade and Development’s Transnationality Index (TNI). The TNI has essentially measured the influence of foreign TNCs on a nation’s economy, and has been calculated based upon four ratios: FDI inflows as a percentage of fixed capital formation over the past three years; FDI inflows as a percentage of GDP; value added by foreign affiliates as a percent of GDP; and employment in foreign affiliates as a percentage of total national employment . A high index has connoted that that nation was significantly dependent upon foreign firms in that given year. Japan at one and the USA, at six, have had the lowest TNI. According to the Lane , Slovakia, with a TNI of 35, had the highest dependency upon foreign firms among the V4 nations of Central Europe; Poland had a TNI of 23, followed by Czechia at 27 and Hungary at 33. In addition, its TNI was among the highest of all so-dubbed semi-periphery nations, including the four BRICs (Brazil, China, India, and China), Mexico, Argentina, Venezuela, and the ASEAN nations of Indonesia, Malaysia, the Philippines and Thailand. Essentially the Bratislava-Zilina Corridor has become a larger form of what Knox, Agnew & McCarthy  and others have labeled an ‘Export Processing Zone,’ i.e., an area’s whose growth has been facilitated by State tax holidays and other incentive policies which were geared solely towards attracting export-oriented foreign automakers to that region. However, in the process of turning the area into a large export-only corridor, the national government has shown little interest in cultivating a native-owned auto industry, nor for that matter, serving its domestic market customer base. This represented a distinct contrast from the days of State Socialism, when TNCs played almost no role in the economy during State Socialism. In summary, since the bulk of its automotive components were imported from the core, virtually all of production was bound for the core, and a tiny proportion of both were exported to emerging nations, Slovakia’s institutional features, at least in the auto industry, do not seem to qualify it as semi-periphery nation under Wallerstein/Chase-Dunn & Hall’s fifth category. These development, however, were not surprising. No longer protected by Soviet political, economic, and military apparatus, and ill-equipped to deal with the sudden marketization of its economy, the Slovak Government had very little choice but to capitulate to western TNC manufacturing power. As a result, as Lane  suggested, these factors suggest that Slovakia’s institutional forms have become less semi-periphery and more peripheral than they were under State Socialism. Despite possessing GDP, GDP per capita, and GNI per capita that are within the middle-tier of nations, and experiencing relatively robust growth since the end of the 2008-2009 global financial crisis, according to the Organization for Economic Cooperation & Development (OECD), Slovakia and its economy are: 1) over-dependent on export-oriented FDI manufacturing in the automotive and consumer electronics sectors; 2) over-reliant on the economic recovery of a highly uncertain Euro Area; 3) impeded by government debt which has now reached constitutional limits; 4) obstructed by government inefficiency, corruption, high job turnover rates, and a lack of transparency; 5) beset by regional economic, infrastructural, and educational inequality that is among the highest among OECD-affiliated nations; 6) inhibited by skill shortages in the Bratislava Region accompanied by labor skills mismatches in the rest of the country; 7) stymied by slow job growth and high unemployment relative to economic growth; and 8) obstructed by stagnating/sluggish growth in disposable incomes which weighs on private consumption . Overall, in agreement with Pavlinek and his collaborators, the OECD believed that their over-dependence on Auto FDI had rendered Slovakia’s city-regions in the Bratislava-Zilina extremely vulnerable to the highly volatile, business cycles of the European auto industry and to potential world economic downturns. If the 2008 to 2013 period can be considered a reliable indicator, this and spatially concentrated, over-reliance on foreign automakers and the related extremely one-sided output to sales ratio will deepen in the near-term. During this period, as production in the Bratislava-Zilina Corridor expanded by 71.71%, from 527,534 to 906,303, domestic nation-wide vehicle sales actually declined by 30.50%, from 102,378 to 75,206 ; early estimates by OICA for 2014 put vehicle production at 993,000 and new passenger car registrations at just 72,249 . The same appears to be the case in the larger tri-national auto zone, as nearby Audi Hungaria and Hyundai Nosovice were expected to expand their combined from 425,000 in 2013 to at least 640,000 by 2018, with local sales growth rates lagging far behind . Although it was too early to discern from available statistics, there is a chance that these imbalances may narrow slightly in the long-term. Starting in December 2011, VW began building a new series of UP! mini/small family cars in Bratislava. As a result, plant output more than doubled from 148,318 in 2011 to 394,474 in 2014, with more two-thirds of this production in 2014 being VW UP! models and its re-badged siblings, the Skoda Citigo, and SEAT Mii models. On the other hand, approximately 40% of overall factory production in Bratislava remained dedicated for the German market [45, 47, 57, 68]. The most expensive of VW Slovakia’s new small car models, the VW Up!, was priced between $12,000 to $17,000 (€9,000-€13,000) and primarily targeted for core Western European markets. The company’s rebadged Skoda Citigo and SEAT Mii, however, which share both a platform and an assembly line with the UP! in Bratislava, were priced around $11,000 to $13,000 (€8,500-€10,000), and the company hopes this will make them affordable for buyers in growing CE markets . Of course such purchases may only serve to replace VW’s Czech-built Skoda and Spanish-built SEAT vehicle sales, as well those of small Peugeot, Citroen, Kia and Hyundai cars. For similar reasons, PSA and Hyundai-Kia also have expanded output and product lines in Slovakia. Both now have two-tiered pricing structures for the small sedans, hatchbacks, and crossovers they build in the country, with both segments primarily exported to Western Europe, but with the lower end also geared to increase sales in emerging Europe. For example, Kia dramatically upgraded its Western Europe-bound Cee’d hatchback and raised its pricing similar to that of VW UP!. Meanwhile, its Venga MPV, introduced in 2009, was priced closer to Skoda Citigo and SEAT Mii and intended for emerging Europe [74, 75]. PSA has followed a similar pricing structure for its Citroen C3 Picasso MPV and its smaller cousin, the Peugeot 207 minis, respectively . The potential growth in domestic sales of vehicles built at home notwithstanding, as discussed earlier, Slovakia’s auto sector has failed, to date, to undertake the kind of import-substitution which transformed the Asian Newly Industrializing Economies (NIEs) and Brazil into the semi-periphery nations. In addition, despite rising incomes, its domestic market for new cars and other middle class consumer goods have remained relatively weak, relative to the aforementioned nations at similar points in their development curve. Finally, in contrast to Wallerstein’s expected semi-periphery growth path, both auto industry employment and production in Slovakia declined, rather than increased, during the most recent severe economic downturn, the 2008-2009 Global Financial Crisis/Great Recession [29, 32, 33, 49, 73]. CONCLUSION: THE SLOVAK ECONOMY: SEMI-DEPENDENT DEVELOPMENT IN A WORLD SYSTEM? In 1999, nearly eight year following VW’s launch of vehicle production at the former BAZ Plant in Bratislava, the Slovak Government began to aggressively recruit automotive FDI in through its ‘Development of the Automotive Industry’ Initiative. The subsidies provided under this program helped facilitate expansions at VW and attracted PSA, Kia, and numerous foreign automotive components manufacturers to the city-regions within the Bratislava-Zilina Corridor. They also earned the government praise from the World Bank, the European Automobiles Manufacturers’ Association (ACEA), Ernst & Young, Price-Waterhouse, Forbes, and others, for its post-Socialist neo-liberal reforms and progressive pro-business climate [76-81]. As a result, employment in Slovakia’s motor vehicles sector has more than tripled from 22,000 in 1993 to more than 82,000 in 2013. While such accolades and outcomes were laudable, has Auto FDI really advanced Slovakia and its city-regions from periphery to semi-periphery status in the world’s industrial division of labor? Through brief review of automotive production related development in Slovakia’s Bratislava-Zilina Corridor, and drawing upon the theories Wallerstein, Chase-Dunn, Arrighi, and CE auto industry researchers, such as Pavlinek, this study examined this question. It found that, based upon Wallerstein and Chase-Dunn & Hall’s typology, outside of its income levels, Slovakia’s auto industry only qualifies it as a semi-periphery nation under the most superficial categorization: Its fortuitous geographic location in the CE. As discussed herein, there have been several factors inhibiting Slovakia’s rise to semi-periphery status. Most prominent among them were: its lack of domestic automakers; its total dependence upon export-oriented Auto FDI; it its highly unbalanced and widening exports to sales ratio; its relatively high transnationality dependency index; and the continuation of its starkly uneven development trends, particularly, income and inward FDI highly favoring the capital city region, Bratislava, as compared with the rest of the nation. In fact, because the Slovak Government sold off Skoda’s BAZ operations to VW, unlike the Asian NIEs of the 1980s and other current semi-periphery nations, such as the BRICs, Slovakia does not contain any domestic-owned auto producers. Foreign automakers built 100% of the 4.34 million automobiles built in the Bratislava-Zilina Corridor between 2006 and 2013, nearly all of which (99 percent), have been exported out of the country. In the interim, 589,365 new vehicles were sold in Slovakia or just 11.06% of total production, with sales down almost a third from their 2008 peak. This situation was almost identical for motor vehicle suppliers, with more than 90% of all components built in Slovakia bound for installation in vehicles assembled in core countries in Western Europe, and with less than half of the all parts installed in Slovakia-built vehicles being domestically manufactured. Furthermore, as Stephen Hymer [82, 83] cautioned more than 40 years ago, this relationship can expect to grow more insecure over time, with the national and local economies becoming more dependent upon FDI and in less control over their own development trajectories. This disembedding process, thereby, can only serve to threaten the long-term prosperity of Slovakia’s citizens, as any of the three foreign automakers building and exporting cars in Slovakia could sometime soon decide to downsize shift some or all of their production to another locale, such as back to the core or to a the lower cost nation in Europe. This already happened during the 2008-2009 Great Recession, when Slovakia experienced significant declines in vehicle output and automotive production related employment . More specifically, Hyundai-Kia could consolidate their CE production in Czechia, or VW could cut output at its Bratislava Plant and shift production: 1) back to Germany; 2) to one of its existing light vehicle assembly factories in Czechia, Hungary, Poland, or Russia; or 3) to a new plant constructed in the nearby lower-cost nations of Belarus, Romania, Serbia, or Slovenia, all of which have aggressively recruited TNC auto plants. On the other hand, at one time, mounting losses at PSA spawned rumors that the French conglomerate would either close its Trnava Plant or sell its automotive business to either, General Motors (GM), Fiat, or China’s Dongfeng Motors [84, 85]. While the Chinese automaker would probably keep PSA’s Slovak factory running, both GM and Fiat have well established operations in Poland, with the latter also having an assembly plant in Serbia. Finally, Hymer [82, 83] claimed that in nations overly dependent upon TNC FDI, statistics on GNP and income tended to disguise the true economic situation within these countries. Rather than promoting development from underdevelopment, he contended that such TNC dominance served to reinforce existing conditions of economic inequality and uneven development within receiver countries . This finding accurately describes the case of Slovakia’s city-regions in 2015. An over-dependence upon export-oriented, TNC-based Auto FDI has done little to ameliorate historically uneven income patterns between Bratislava and the rest of the nation, even with the two other city-regions within the Bratislava-Zilina Corridor which have automobile assembly plants: Trnava and Zilina [3, 30, 40, 43, 87-92]. The latter and Trencin have continued to have average annual/monthly wages that were less than 95 percent of national mean. In the face of these findings, this article concludes that despite possessing GDP and GNI per capita levels that ranked it in the middle-tier of nations, and despite its entry into the EMU, Slovak and its Bratislava-Zilina Corridor’s city-regions, have not, as of yet, ascended from a peripheral to a semi-peripheral position in the world’s automotive industrial division of labor. Rather, their structural status now more closely resembles what might be called, the upper perimeter of the periphery, an area’s whose income may rank within the semi-periphery, but where peripheral-like economic and institutional activities remain much more common than core-like activities. Wallerstein I. Concepts for comparative analysis. Comp Stud Soc Hist 1974; 16(4): 387-415. Wallerstein I. Modern world-system I-III. New York: Academic Press 1974-1989. Chase-Dunn C, Hall T. Rise and demise: Comparing world Systems. Boulder: Westview Press 1997. Arrighi G, Drangel J. The stratification of the world economy: An exploration of the semiperiperhal zone. Review 1986; 10(1): 9-74. [Fern Braud Ctr]. McKenzie R. The concept of dominance and world organization. Am J Sociol 1927; 33(1): 18-42. Wallerstein I. The capitalist world-economy: Essays by Immanuel Wallerstein. New York: Cambridge University Press 1979. Wallerstein I. Modern world-system I-IV: Centrist liberalism triumphant, 1789-1914. Berkeley: University of California Press 2011. Chase-Dunn C, Ed. Socialist states in the world system. Beverly Hills: Sage 1982. Chase-Dunn C. The world-system since 1950: what has really changed? In: Bergquist C, Ed. Labor in the capitalist world-economy. Beverly Hills: Sage 1984; pp. 75-104. Chase-Dunn C. Global formation: Structures of the world economy. Lanham, MD: Rowman & Littlefield Publishers 1998. Arrighi G, Ed. Semiperipheral development: The politics of southern europe in the twentieth century. Beverly Hills: Sage Publications 1985. Arrighi G. The long twentieth century: Money, power, and the origins of our times. New York: Verso 2010. Timberlake M. World system theory and the study of comparative urbanization. In: Smith M, Feagin J, Eds. The capitalist city. Cambridge, MA: Basil Blackwell 1987; pp. 37-65. Domanski B, Lung Y. The changing face of the European periphery in the automotive industry. Eur Urban Reg Stud 2009; 16(1): 5-10. Lung Y. The changing geography of the European automobile system. Int J Auto Tech Man 2004; 3(2-3): 137-65. Carrillo J, Lung Y, Van Tulder R, Eds. Cars, carriers of regionalism?. Basingstoke: Palgrave Macmillan 2004. Humphrey J, Lecler Y, Salerno M, Eds. Global strategies and local realities: The auto industry in an emerging market. New York: Macmillan Press 2000. Pavlinek P, Domanski B, Guzik R. Industrial upgrading through foreign direct investment in central European automotive manufacturing. Eur Urban Reg Stud 2009; 16(1): 43-63. Domanski B, Guzik R, Gwodz K. The new international division of labor and the changing role of the periphery: The case of the Polish automotive industry. In: Tamasy C, Taylor M, Eds. Globalising worlds and new economic configurations. Aldershot: Ashgate 2008; pp. 85-99. Domanski B, Gwodz K. Toward a more embedded production system? automotive supply networks and localized capabilities in Poland. Growth Change 2009; 40(3): 452-82. Domanski B, Guzik R, Gwodz K, Dej M. The crisis and beyond: The dynamics and restructuring of automobile industry in Poland. Int J Auto Tech Man 2013; 13(2): 151-66. Pavlinek P. Restructuring of the Polish passenger car industry through foreign direct investment. Eura Geog and Econ 2006; 47(3): 353-77. Pavlinek P. A successful transformation? Restructuring of the Czech automobile industry. Omaha: Physica-Verlag 2008. Pavlinek P. The internationalization of corporate R&D and the automotive industry R&D of East-Central Europe. Econ Geogr 2012; 88(3): 279-310. Pavlinek P. The impact of the 2008-2009 crisis on the automotive industry: Global trends and firm-level effects in Central Europe. Eur Urban Reg Stud 2015; 22(1): 20-40. Pavlinek P. Whose success? The state–foreign capital nexus and the development of the automotive industry in Slovakia. Euro Urb and Reg Stud 2015; 22, forthcoming. First published online in December 10, 2014. Pavlinek P, Janak L. Regional restructuring of the Skoda auto supplier network in the Czech Republic. Eur Urban Reg Stud 2007; 14(2): 133-55. Pavlinek P, Zenka J. The 2008-2009 automotive industry crisis and regional unemployment in Central Europe. Camb J Regions Econ Soc 2010; 3(3): 349-65. Pavlinek P, Zenka J. Upgrading in the automotive industry: firm-level evidence from Central Europe. J Econ Geogr 2011; 11: 559-86. Smith A, Swain A. The global economic crisis, Eastern Europe, and the former Soviet Union: models of development and the contradictions of internationalization. Eurasian Geo Econ 2010; 51(1): 1-34. Rugraff E. Are the FDI policies of the Central European countries efficient? Post-Comm Econ 2008; 20(3): 303-16. Rugraff E. Foreign direct investment (FDI) and supplier-oriented upgrading in the Czech motor vehicle industry. Reg Stud 2010; 44(5): 627-38. Evans P. Class, state and dependence in East Asia: Lessons for Latin Americanists. In: Deyo F, Ed. The political economy of the new Asian industrialism. Ithaca, NY: Cornell University Press 1987; pp. 203-26. Myant M. The Czechoslovak economy, 1948-1988. New York: Cambridge University Press 1989. Pavlinek P. Restructuring the Central and Eastern European automobile industry: Legacies, trends, and effects of foreign direct investment. Post Sov Geogr Econ 2002; 43(1): 41-77. Smith A. Reconstructing the regional economy: Industrial transformation and regional development in Slovakia. Cheltenham, UK: Edward Elgar 1998. Volkswagen VW. Facts and figures, Navigator 2013. Wolfsburg: VW Group 2013. Pavlinek P, Smith A. Internationalization and embeddedness in East-Central European transition: The contrasting geographies of inward investment in the Czech and Slovak Republics. Reg Stud 1998; 32(7): 619-38. Ward’s Communications. Ward’s automotive yearbook, 2014. Southfield, MI: Ward’s 2014. Ward’s Communications. Ward’s world’s vehicle data 2014. Southfield, MI: Ward’s 2014. Jacobs, A. J. Auto FDI in emerging Europe: Shifting production locales in the world auto industry. London: Palgrave, forthcoming. Based upon the author’s: site visits and/or factory tours of VW Bratislava, VW Martin, PSA Trnava, Kia Zilina, and Audi Gyor; and correspondences with government officials, automakers, and scholarly experts in the CE and Western Europe, from April 2011 through March 2016. Audi AG. Audi: 2014 annual report. Ingolstadt, Germany: Audi Group 2015. Hyundai Motors. Hyundai motor manufacturing Czech. General Information. Nosovice, CZ. [Retrieved June 15, 2015]. Available from: http://www.hyundai-motor.cz/english.php This included Hyundai ix20 and i30 (known as Elantra elsewhere), twins of the Kia Venga and Cee’d, respectively. Smith A, Ferencíkova S. Inward investment, regional transformations, and uneven development in East-Central Europe: Case studies from Slovakia. Eur Urban Reg Stud 1998; 5(2): 155-73. Pavlinek P. Transformation of the Central and East European passenger car industry: selective peripheral integration through foreign direct investment. Environ Plann A 2002; 34(9): 1685-709. Pavlinek P. Regional development implications of foreign direct investment in Central Europe. Eur Urban Reg Stud 2004; 11(1): 47-70. Moving Progress VW. Volkswagen AG Annual Report 2014. Wolfsburg: VW Group Communications 2015. For Kia, 99% of the vehicles manufactured at Kia Zilina in 2013 and 99.1% of their total value, were exported out of the country. For PSA Trnava, these figures were 99% and 96.0%, respectively [see 49]. Lane D. Postsocialist states in the system of global capitalism: A comparative perspective. In: Boschi R, Santana C, Eds. Development and Semi-periphery: Post-neoliberal trajectories in South America and Central Eastern Europe. London: Anthem 2012; pp. 19-43. Knox P, Agnew J, McCarthy L. The geography of the world economy. 6 ed. New York: Routledge, 2014. OECD. OECD economic surveys: Slovak Republic 2014. November 2014. Paris: Organization for Economic Cooperation & Development. Similar findings were reported in the OECD. Econ Outlook 2013; 2013: 1-93. [Paris: OECD.]. Kia’s somewhat larger Zilina-built Sportage/Hyundai ix35 SUV also was geared primarily for Western Europe. Interestingly, earlier editions of this model were built by the independent carmaker Karmann in Osnabruck, Germany. Karmann went bankrupt in 2009 and was absorbed by its largest customer, none other than VW [see 83]. Ernest & Young. The Central and Eastern European automotive market: Industry overview. Stuttgart & Detroit: Ernest & Young, March 2010. ACEA. Automotive industry in the new EU member states: Slovak Republic - Largest per capita car producer. Brussels: European Automobile Manufacturers’ Association 2008. ACEA. EU economic report: July 2011. Brussels: European Automobile Manufacturers’ Association 2011. Stenning A, Smith A, Rochovska A, Swaitek D. Domesticating neo-Liberalism: Spaces of economic practice and social reproduction in post-socialist cities. Malden, MA: Wiley Blackwell 2010. Hymer S. The multinational corporation and the international division of labor. In: Cohen R, Felton N, Nkosi M, Van Liere J, Eds. The multinational corporation: A radical approach. New York: Cambridge University Press 1979; pp. 140-64. Hill R, Feagin J. Detroit and Houston: Two cities in global perspective. In: Smith M, Feagin J, Eds. The capitalist city: Global restructuring & community politics. Oxford: Basil Blackwell 1987; pp. 155-77. Capek A, Sazama G. Czech and Slovak economic relations. Eur Asia Stud 1993; 45(2): 211-35. Myant M. Centre periphery relations in Czechoslovakia. J Interdiscip Econ 1992; 4(2): 269-80. Myant M. Transforming the Czech and Slovak economies: Evidence at the district level. Reg Stud 1995; 29(8): 753-60. Pavlinek P. Regional development and the disintegration of Czechoslovakia. Geoforum 1995; 26(4): 351-72. Smith A. From convergence to fragmentation: Uneven regional development, industrial restructuring, and the ‘transition to capitalism’ in Slovakia. Environ Plann A 1996; 28(1): 135-56.